I was talking with a student the other day about human rights and economic rights, and it reminded me of a passage written by E.B. White--yes, the author of Stuart Little, Charlotte's Web, Trumpet of the Swan, and of course, with William Strunk, co-author of The Elements of Style. White suggests the following analogy: economic rights are like croquet balls, and human rights are like eggs. If you jumble them together, the eggs are likely to get broken. The analogy seems to me to have enough truth in it to be worth pondering. In the same letter, White makes some other statements worth consideration. "There is, I believe, a very real and discernible danger, to a country like ours, in an international covenant that equates human rights with human desires, and that attempts to satisfy, in a single document, governments and philosophies that are essentially irreconcilable. I do not think it safe or wise to confuse, or combine, the principle of freedom of religion or the principle of freedom of the press with any economic goal whatsoever, because of the likelihood that in guaranteeing the goal, you abandon the principle. This has happened over and over again." "A right is a responsibility in reverse; therefore, a constitutional government of free people should not ward any “rights” that it is not in a position to accept full responsibility for." The relevant passages come from a letter, which I'll include here, from White to Margaret Halsey on April 23, 1953. It appears in the Letters of E.B. White, collected and edited by Dorothy Lugano Guth (Harper and Row, 1976). In turn, White's letter refers to an essay written by Halsey about taking her daughter to the public library, and I'll include a bit of that essay below (the full essay is available via JSTOR). Also to provide context, Halsey was writing in response to an editorial that White had written in the New Yorker on April 18, 1953. I'll include a slice of that below as well. I had just read your piece in the ALA Bulletin about taking your daughter to the public library, where she liked “the little chairs and the books about fierce things,” when your letter arrived protesting the editorial in the April 18th issue about human rights. Since I am the author of the offending remarks, it is up to me to answer your complaints. The New Yorker isn’t against freedom from want and didn’t attack it or minimize it as a goal. But we’re against associating freedom from want (which is an economic goal) with freedom of speech (which is an exact political principle). There is, I believe, a very real and discernible danger, to a country like ours, in an international covenant that equates human rights with human desires, and that attempts to satisfy, in a single document, governments and philosophies that are essentially irreconcilable. I do not think it safe or wise to confuse, or combine, the principle of freedom of religion or the principle of freedom of the press with any economic goal whatsoever, because of the likelihood that in guaranteeing the goal, you abandon the principle. This has happened over and over again. Eva Peron was a great freedom-from-want girl (specially at Christmas time), but it also happened that La Prensa died and the Argentinians were left with nothing to read but government handouts. If you were to pack croquet balls and eggs in a single container, and take them travelling, you would probably end your journey with some broken eggs. I believe that if you put a free press into the same bill with a full belly, you will likely end the journey with a controlled press. In your letter you doubt whether the man who wrote the editorial had given much thought to the matter. Well, I’ve been thinking about human rights for about twenty years, and I was even asked, one time during the war, to rewrite the government pamphlet on the Four Freedoms — which is when I began to realize what strange bedfellows they were. A right is a responsibility in reverse; therefore, a constitutional government of free people should not ward any “rights” that it is not in a position to accept full responsibility for. The social conscience and the economic technique of the United States are gaining strength, and each year sees us getting closer to freedom from want. But I’m awfully glad that the “right to work” is not stated in our bill of rights, and I hope the government never signs a covenant in which it appears. My regards to your daughter, who (human rights or no human rights) is my favorite commentator on the subject of public libraries. Every Saturday morning my husband and I take our little girl, aged four and a half, down to the Children's Room of the local public library to change her books. This is a fixed routine in our household, and if anything hap pens to interfere with it, my daughter reacts in a way which gives grim promise of future juvenile delinquency. Speaking rather idly, I asked my daughter one day what it is she likes about the public library. "The little chairs," she answered promptly, "and the books about fierce things." After a moment's pause, she added, "And the librarian with the long brown hair." As a matter of fact, one of her first gestures toward freeing herself of the maternal apron strings--this was way back a year and a half ago, when she was three--was her insistence that she should take her books into the Children's Room by herself. Furtive lurking by the parents outside the door was not encouraged. She made us wait in the street. We did not, of course, know what transpired in the Children's Room; but as she never emerged with VASC to WEB of the Encyclopedia Britannica, we concluded she had found out how to cope. Should Individual Tax Returns Be Public Information? My guess is that if you asked Americans if their income taxes should be public information, the answers would mostly run the spectrum from "absolutely not" to "hell, no." But the idea that tax returns should be confidential and not subject to disclosure was not a specific part of US law until 1976. At earlier periods of US history, tax returns were sometimes published in newspapers or posted in public places. Today, Sweden, Finland, Iceland and Norway have at least some disclosure of tax returns--and since 2001 in Norway, you can obtain information on income and taxes paid through public records available online. Here are some moments in US history involving the disclosure of income tax information, followed by a few thoughts of my own. I'll draw here the Disclosure and Privacy Law Reference Guide published by the IRS in 2012. "The history of tax information confidentiality may be traced to the Civil War Income Tax Act of 1862, when tax information was posted on courthouse doors and sometimes published in newspapers to promote taxpayer surveillance of neighbors. ... In 1870, the Commissioner prohibited newspaper publication of the annual list of assessments, but the list itself remained available for public inspection. The Revenue Act of 1870 confirmed this directive. Two years later, in part because of problems stemming from publicity of tax returns, the income tax law was allowed to expire. When the income tax was reinstated by the Revenue Act of 1894, Congress affirmatively prohibited both the printing and the publishing in any manner of any income tax return unless otherwise provided by law, and provided criminal sanctions for unlawful disclosure. In 1895, the Supreme Court declared the income tax unconstitutional ..."
as soon as practicable in each year cause to be prepared and made available to public inspection . . . lists containing the name and . . . address of each person making an income tax return . . . together with the amount of income tax paid by such person. As a result of the 1924 Act, newspapers devoted pages to publishing the taxes paid by taxpayers, and the right of newspapers to publish these lists was upheld by the Supreme Court.The Revenue Act of 1926, however, removed the provision requiring that the amount of tax be made public while leaving the requirement that a list be published containing the name and address of each person making an income tax return." repealed even before it took effect." The Senate Select Committee on Presidential Campaign Activities (Watergate Committee) hearings revealed that former White House counsel John Dean had sought from the IRS political information on so-called "enemies." Furthermore, it was disclosed that the White House actually was supplied with information about IRS investigations of Howard Hughes and Charles Rebozo. The Committee noted that tax information and income tax audits were commonly requested by White House staff and supplied by IRS personnel. [A]s part of the Tax Reform Act of 1976 ... Congress recognized that the IRS had more information about citizens than any other federal agency and that other agencies routinely sought access to that information. Congress also understood that citizens reasonably expected the IRS would protect the privacy of the tax information they were required to supply. If the IRS abused that reasonable expectation of privacy, the resulting loss of public confidence could seriously impair the tax system. ... Ultimately, Congress amended section 6103 to provide that tax returns and return information are confidential and are not subject to disclosure, except in the limited situations delineated by the Internal Revenue Code. "Each citizen has a personal interest, a pecuniary interest in the tax return of his neighbor. We are members of a great partnership, and it is the right of each to know what every other member is contributing to the partnership and what he is taking from it." "While the government does not know every source of income of a taxpayer and must rely upon the good faith of those reporting income, still in the great majority of cases this reliance is entirely justifiable, principally because the taxpayer knows that in making a truthful disclosure of the sources of his income, information stops with the government. It is like confiding in one's lawyer. ... There is no excuse for the publicity provisions except the gratification of idle curiosity and filling of newspaper space at the time the information is released." Both comments raise interesting questions. For example, the last few words of Harrison's comment in 1898 suggest that if we are going to have a conversation about revealing tax returns publicly, perhaps we should also have a discussion about revealing publicly all amounts and kinds of government assistance received. When Mellon writes in 1924 that the government does not know sources of income, he is of course writing at a time before income taxes are automatically withheld from wages, and at a time before employers and financial institutions send detailed records of income paid to the government which can be checked against income tax returns. Norway has a long history of public disclosure of information from income tax returns, going back at least to the middle of the nineteenth century. Citizens could visit the local tax office or the city hall and look through a book that contained information about each taxpayer in the local area. Persons were listed by name and address, along with key measures from the income tax return: income, tax payment, and wealth. The information was generally available for three weeks after the tax statement was made public. As the media had access to the same type of information, local newspapers would often communicate highlights from the lists, such as rankings of the citizens with highest wealth and income, or incomes of sports and entertainment celebrities. Norway, especially shortly after the release of new annual information. Would we expect tax returns on the Internet to alter tax payments? For example, one possibility is that people might be less likely to hide income, for fear that if they reported a low income but had a visibly high level of spending (new car, big vacation, home remodelling), the neighbors might turn them in to the tax authorities. Of course, this 3% figure cannot easily be applied to other proposals that would make income taxes public. After all, the shift in Norway was from publicly available, but not on the Internet, to publicly available, and also on the Internet. Moreover, one suspects that the very fact that Norway makes tax information public suggests that attitudes about taxes and tax enforcement may differ there from many other countries. For example, did you notice in the earlier quotation that Norwegians are required not only to disclose their income and tax payments each year, but also their wealth? My stock market investments are in no-load broad-based index fund, just like Warren Buffett recommends. But it seems as if more and more people are looking for a "socially responsible" fund which either rules out certain investments or tries to put pressure on companies to sell off or alter certain lines of business, often those related to tobacco, alcohol, gambling, "adult entertainment." In a chapter in the Credit Suisse Global Investment Returns Yearbook 2015 (published February 2015), Elroy Dimson, Paul Marsh and Mike Staunton write on the question: "Responsible investing: Does it pay to be bad?" They point out that at least at a rhetorical level, claims of responsible investing have become widespread (citations omitted). The world’s largest asset owners now devote extensive resources to social and environmental issues and corporate governance, and to engaging with investee companies on these issues. The extent of engagement is reported to be at an all-time high. The UN-supported Principles for Responsible Investment lists 1,349 signatories with assets of over USD 45 trillion, around half the assets of the global institutional investor market. The Global Sustainable Investment Alliance estimates that worldwide some USD 14 trillion of professionally managed portfolios incorporate environmental, social and governance concerns into their decisions. ... Under the UN Global Compact, more than 12,000 business organizations in 145 countries have committed to responsible and sustainable corporate practices. [T]he very largest asset owners are increasingly “universal owners” ... They are now so large that they essentially own every company in the market. Furthermore, many of them have investment horizons that extend into the distant future. Universal owners cannot escape costly, company-specific factors: if one investee company benefits at the expense of creating additional costs for another, there may be no net gain to an asset owner with shares in both. Logically, universal owners should focus on increasing the size of the cake – the aggregate value of all corporations – rather than being too concerned about how the cake is sliced up between companies. An example of this broader focus is labor practices. Some investee companies may lower production costs by employing children, or by sourcing from companies that employ children, but they are unlikely to pay the costs of poor child health or under-education. The universal owner may recognize that child labor in one firm reduces the profitability of other firms who do not employ children, and that impaired education may impede broader economic progress. From a long-term perspective, the owner can therefore benefit financially by engaging with companies and regulatory authorities. Of course, pursuing socially responsible investment--however defined--raises a possibility of missing out on high returns. As the authors point out, vice can be profitable: "The rationale for "vice investing" is that these companies have a steady demand for their goods and services regardless of economic conditions, they operate globally ("vice" is a worldwide phenomenon), they tend to be high-margin businesses, and they are in industries with high entry barriers." 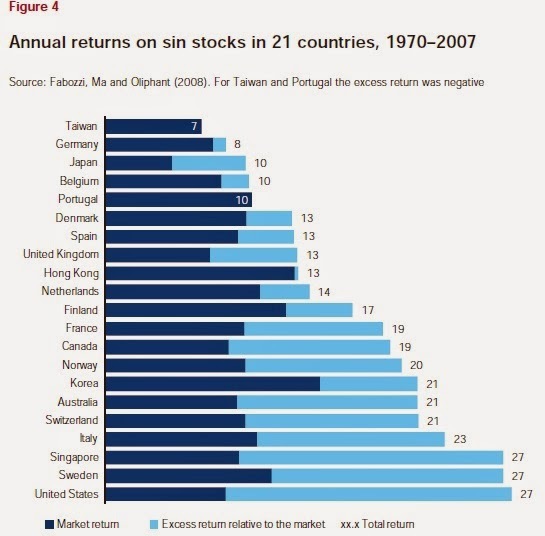 of USD 1.5 billion ..."
Or as another example, here's a different study comparing "sin stocks" to market returns for a variety of countries from 1970 to 2007. In most countries, sin stocks comfortably beat the market. The "sin" industries in this study included alcohol, tobacco, "adult services," weapons, and gambling. As a final example, the enormous pension fund run by the California Public Employees' Retirement System announced with some fanfare in 2002 that it would not invest in countries that fell short in various categories, which among others ruled out China and Russia, which cost the fund enough that the policy soon changed. An application of country exclusion was adopted in 2002 by CalPERS, whose Permissible Emerging Market Policy blacklisted entire countries that fell short of a minimal threshold on factors such as political stability, democratic institutions, transparency, labor practices, corporate responsibility and disclosure. The resulting restriction on investing in Russia, China and other (then) high-performing emerging markets was costly: “by late 2006, CalPERS’ emerging market portfolio had been subject to 2.6% in annual opportunity cost of foregone return, totaling over USD 400 million in losses from the time of the policy’s inception” (Huppé and Hebb, 2011). In 2007, CalPERS dropped its emerging-market country withdrawal strategy, and switched to a principles-based approach to selecting companies in the developing world. They chose to use voice rather than exit within emerging markets, and embraced dialogue, engagement and shareholder activism. Of course, this change by CalPERS raises the possibility that talking about principles is a cheap way of satisfying those who care without giving up on the higher returns, and perhaps without accomplishing much change either. 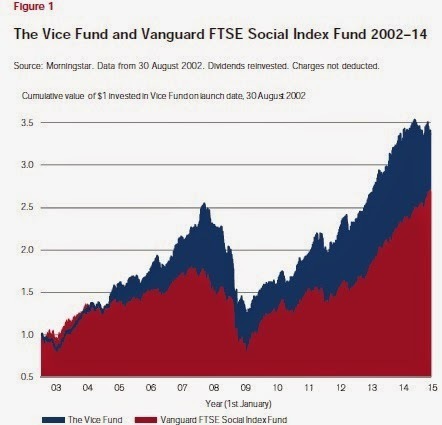 Dimson, Marsh and Staunton argue that the higher returns received by vice may be in part due to those who prefer not to invest in these firms. This pattern may explain why it's hard to find evidence that divesting from a stock causes the company to alter its behavior: after all, if those with strong objections to a company's behavior divest, the remaining shareholders who don't care that much receive higher returns. Win-win! Sort of. To maximize the probability of success as an activist, asset owners might consider the “washing machine” strategy advocated by Gollier and Pouget (2014). They argue that a large investor can generate continuing outperformance by buying non-responsible companies and turning them into more responsible businesses. After they have been cleaned up, the shares may then be sold at a price that reflects the accomplishments of the activist. Back in the day, I headed a college committee that recommended that the college divest its endowment holdings of South African mining companies. The standard list of "sin stocks" often includes alcohol, tobacco, gambling, "adult entertainment," and weapons. Other lists would focus on how firms treat their workers, or on what firms require on how their suppliers (or the suppliers of their suppliers) treat labor. More recently, there are sometimes proposals to pressure or divests from companies that are involved with fossil fuels or companies that are involved in biotechnology that can lead to products based on gene modifications. Another recent category is to pressure companies that are deemed to have pushed too hard to reduce their taxes. "Despite its credentials as a purveyor of Fair Trade coffee, Starbucks has become a boycott target because of its UK tax avoidance practices. Despite its inclusion in the Dow Jones Sustainability World Index and FTSE4Good Index, Medtronic has been excoriated in the USA for its tax-inversion scheme. Amazon, a company praised for environmental initiatives, is accused in Europe and the USA of anticompetitive tax arrangements." If an investor is considering an strategy of buying either the entire market in an index fund, or just ruling out a few companies from that entire market index, the difference in terms of return on investment or diversification will be small. But if you start ruling a large number of companies, the effects on returns and diversification can increase accordingly. For those concerned about corporate social responsibility, it seems potentially counterproductive to engage in these issues by disengaging from owning any of the relevant companies, while the alternative of participating in shareholder activism may be a more productive path. Back in 2002, the United Nations established a set of "Millennium Development Goals," which were phrased as a combination of overall "goals" and more specific "targets." For example, the first "goal" was "Eradicate Extreme Poverty and Hunger," but the first specific target under that goal was "Halve, between 1990 and 2015, the proportion of people whose income is less than $1.25 a day." (Thanks in large part to the explosive growth in the economies of China and India, this target was in fact reached five years earlier.) Many of the specific targets used the year 2015 as an end-date, and so the UN has been engaged in thinking about what the next set of goals or targets should be. Last summer, it settled on a list of 17 goals that include 169 targets. The UN list seems open to two overall criticisms. First, 169 targets is unwieldy--more a wish-list than a considered policy agenda. However, apparently now that it has been agreed upon altering the of 169 targets is politically impossible. More important, the UN list of goals and targets seems to imply that if we just agree on the 169 targets, we don't really need to discuss what actual policy choices would do the most to accomplish those goals and targets. But of course, if two policies seem likely to reduce poverty or improve health or protect the environment to the same extent, but one policy has much lower costs than the other, it makes sense to concentrate on the the cost-effective approaches first. The Copenhagen Consensus Center has been taking on the job of commissioning research to evaluate policies to achieve the targets, when then draw on existing research about the costs and benefits of these policies. Based on these studies, which are available here, a group of three prominent economists--Finn Kydland, Tom Schelling, and Nancy Stokey--have just recommended a set of 19 policies and targets that all appear based on the existing research to have benefits that are at least 15 times greater than costs. Here is the list of 19 priorities, quoted from the March 26 press release from the three economists. he underlying research papers with details about policies, costs, and benefits are available here. 2) Halve malaria infection. Distributing long lasting insecticide treated bed-nets and delaying resistance to the malaria drug artemisinin will cost $0.6bn, prevent 100m cases of malaria and save 440,000 lives per year. 3) Reduce tuberculosis deaths by 90%. Massively scaling up detection and treatment of tuberculosis will cost $8bn and save up to an additional 1.3m lives per year. 4) Avoid 1.1 million HIV infections through circumcision. Circumcising 90% of HIV-negative men in the 5 worst affected countries will cost $35m annually and avert 1.1m infections by 2030 with the preventive benefit increasing over time. 5) Cut early death from chronic disease by 1/3. Raising the price of tobacco, administering aspirin and preventative therapy for heart disease, reducing salt intake and providing low cost blood pressure medicine will cost $9bn and save 5m lives per year. 6) Reduce newborn mortality by 70%. Protecting expecting mothers from disease, having skilled medical staff support their deliveries, and ensuring high quality postnatal care will cost $14bn and prevent 2m newborn deaths per year. 7) Increase immunization to reduce child deaths by 25%. Expanding immunization coverage to include protection from forms of influenza, pneumonia and diarrheal disease will cost $1bn and save 1m children per year. 8) Make family planning available to everyone. Allowing women to decide if, when, and how often they become pregnant will cost $3.6bn per year, cut maternal deaths by 150,000, while allowing more attention and education to remaining children. 9) Eliminate violence against women and girls. Right now, every year 305 million women are domestically abused, costing the world $4.4 trillion in damages. 10) Phase out fossil fuel subsidies. Removing fossil fuel subsidies will lower carbon emissions and free up $548bn in government revenue to spend on for example, health, infrastructure and education. 11) Halve coral reef loss. Protecting marine habitats will cost $3bn per year but will prevent the loss of 3m hectares of coral reef, providing natural fishing hatcheries and boosting tourism. 12) Tax pollution damage from energy. Air pollution is the world’s biggest environmental killer, causing more than 7m annual deaths. Taxes proportional to the damage from air pollution and CO₂ will reduce environmental impacts efficiently. 13) Cut indoor air pollution by 20%. Providing more clean cookstoves will cost $11bn and prevent 1.3m deaths per year from indoor air pollution. 14) Reduce trade restrictions (full Doha). Achieving more free trade (e.g. the Doha round) would make each person in the developing world $1,000 richer per year by 2030, lifting 160m people out of extreme poverty. 15) Improve gender equality in ownership, business and politics. Ensuring women can own and inherit property, perform basic business needs like signing a contract and be represented in parliament will empower women. 16) Boost agricultural yield growth by 40%. Investing an extra $8bn per year in agricultural R&D to boost yields will reduce food prices for poor people, mean 80m fewer people go hungry and provide benefits worth $82bn per year. 17) Increase girls’ education by two years. Ensuring girls receive more education will increase their future wages, improve their health, reduce their risk of violence and start a virtuous cycle for the next generations. 18) Achieve universal primary education in sub-Saharan Africa. At a cost of $9bn per year, this target will ensure 30m more kids per year attend primary school. What's the single best policy in terms of benefit-cost ratio? The background research paper by Kym Anderson suggests that completing the Doha talks for greater trade liberalization would have benefits for developing countries that are 2,100-4,700 times greater than costs. As Anderson points out, a growing body of work in international trade in the last couple of decades has pointed out that the static gains from trade--say, the U.S. trading wheat-for-oil with Saudi Arabia--are relatively small in the contest of an overall economy. Instead, the big gains from trade arise because of how trade leads to increases in productivity. For example, trade leads to spillovers of knowledge, or the spread of improved methods of management. Trade can stimulate international investment and growth of a financial sector, which has spillover effects for other firms. Global supply chains let producers specialize in the very specific areas where they have the greatest advantage. It lets producers in small countries take advantage of economies of scale when the produce for bigger markets, and lets consumers in small countries benefit from economies of scale when they import from other countries. Trade can provide an additional incentive for national governments to follow sensible macroeconomic and regulatory policies--which again can help all producers in an economy, not just exporters and importers. I haven't read all the background paper, much less all the research cited in those papers, and so I don't have strong opinions about whether this list of 19 targets is necessarily the best one. But if the choice is between spreading out the scarce resources of time, money, and enthusiasm that are available for development efforts across 169 targets, or focusing those resources on the much smaller number of targets and policies with high payoffs, I know which approach is likelier to benefit low-income people around the world. Economists sometimes argue that more choices must either be neutral or good. The logic is that if you don't want any of the additional choices, then don't take them, and you are equally well off. If you do want one of the additional choices, you are then better off. Of course, this argument is not airtight. It assumes that there are no costs of evaluating more choices, and it presumes that the chances of choosing wisely and well are not diminished as the number of choices rises. For one case in which these issues arise, consider the many changes in financial markets and government regulations that have made it vastly easier for people to take out a mortgage loan and buy a house. I certainly view the option to take out a mortgage loan as beneficial to me, because rather than spend years saving up enough money to buy a house outright, I can live in the house while paying down the mortgage over time. But this additional choice also brings dangers. People are often notably bad at evaluating situations where the costs and benefits are spread out over time. We find ourselves in situations where we would like to save money, or start exercising more, or eating healthier--but always starting tomorrow, never today. Many people find themselves running up credit card bills to have the benefits of consumption now, with the costs of paying shoved into the future. Thus, it wouldn't be surprising to find that when the option to take out a long-term mortgage becomes available, people are tempted to over-borrow. My grandmother used to have a saying about people who bought all the house that the bank told them they could afford, and often a little more: "You can't eat bricks and mortar." For example, one common rule-of-thumb when applying for a mortgage is that you can "afford" a house if the loan payments will be 30% or less of gross income. Of course, this rule is based on the likelihood that the loan will be repaid to the bank, not on whether you will feel good in a year or five years about how much you have spent. If someone told you what was the most you could spend on some other purchase--like a car or a vacation--you probably wouldn't feel semi-obligated to spend that actual amount. Òscar Jordà, Moritz Schularick, and Alan M. Taylor explore some big-picture issues with this dynamic in "Mortgaging the Future?" written as an "Economic Letter" for the Federal Reserve Bank of San Francisco (March 23, 2015, 2015-09). From their abstract: "In the six decades following World War II, bank lending measured as a ratio to GDP has quadrupled in advanced economies. To a great extent, this unprecedented expansion of credit was driven by a dramatic growth in mortgage loans. Lending backed by real estate has allowed households to leverage up and has changed the traditional business of banking in fundamental ways. This “Great Mortgaging” has had a profound influence on the dynamics of business cycles." Here's an illustration showing the ratio of mortgage lending to the total value of housing in the United States. In 1960 and in in 1990, with some bumps between, mortgages were equal to about 30% of the value of the housing stock: to put it another way, on average people were living in houses where 70% of the value of the house was their own equity in the home. 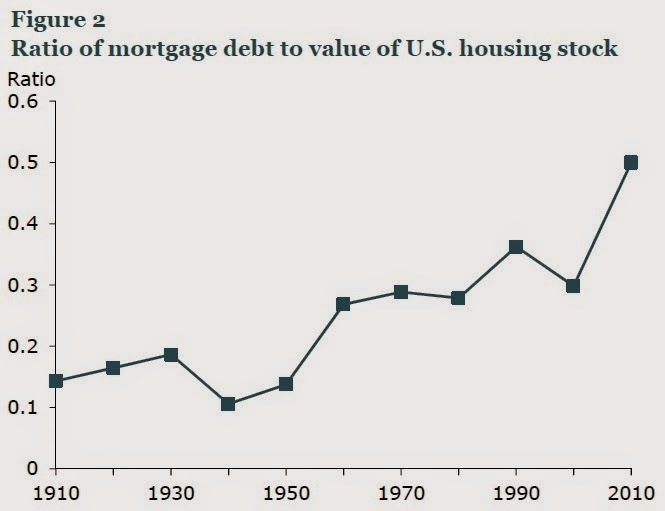 By 2010, mortgages were 50% of the value of the housing stock. 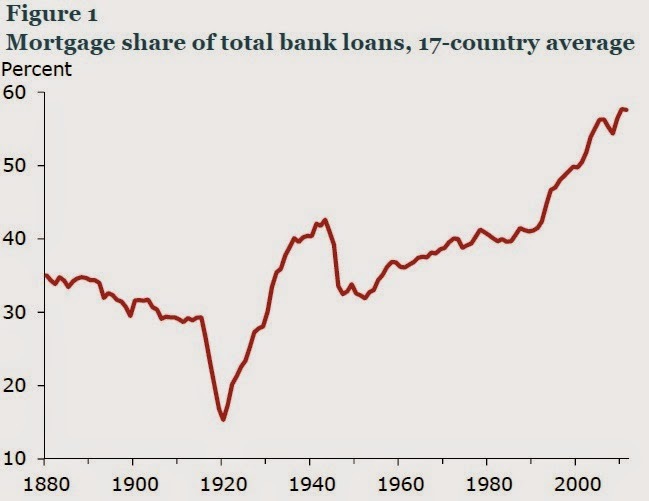 Across the high-income countries of the world, mortgage lending has become the dominant business for banks, rather than lending to businesses or making other kinds of loans to individuals. In other words, the tacit encouragement from regulators, the financial industry, and the tax code to buy a house doesn't just run a risk that some homebuyers will overborrow. It also makes recessions worse and, as in 2007-2009, can even threaten broader financial stability. At the household level, this sharpens the question of what we think of as the expected or normal amount of housing consumption. Back in the early 1970s, the average new single-family house had 1,660 square feet, which peaked at over 2,500 square feet for a new house in 2007, and then declined a bit after bubble in housing prices popped. Let me offer a speculation: Say that the rules for taking our a mortgage had been tighter over time. Imagine the standard was that banks would decide what you can afford based on 25% of your income, not 30%, or that mortgages were typically available for 15 or 20 years, not 30. My guess is that bank lending for mortgages would be smaller. The size of homes might well have increased, but not as quickly. Less of US capital investment would be allocated to housing, which would make it possible for more to be allocated to investments that can raise the long-term standard of living. The US economy would be less vulnerable to recession. People who were less stretched in making their mortgage payments would be less likely to face default or foreclosure. And my guess is that many of us would have adapted perfectly well to living in smaller homes, because the smaller size would be usual and typical and what we expect. The money we weren't spending on housing would easily be spent on other forms of consumption. In short, the push for making mortgage loans more easily available is sometimes presented as if it can only make people better off. Either they can borrow the same amount as before, or they can decide that they would prefer to borrow more. But making mortgages more available also has number of tradeoffs, both for individuals who "can't eat bricks and mortar" and for the broader economy. There's a long tradition in political economy, stretching back at least to Plato's discussion of "philosopher-kings," which speculates that the best form of government might be a benevolent dictatorship. In a way, this argument is bulletproof, because any response that points out the real-world problems of dictatorship can be countered by saying that it's just not sufficiently benevolent. But in my lifetime, the best example anyone could cite of a benevolent dictatorship that seemed to be working pretty well was Lee Kuan Yew, who was the official leader of Singapore from 1959 to 1990, and the unofficial leader for some years after that. He died on Monday at the age of 91. Thus, it seems a useful time for a quick review of the economy he left behind. In some ways, the most straightforward case for Lee Kuan Yew is in the basic economic statistics of long-term growth. 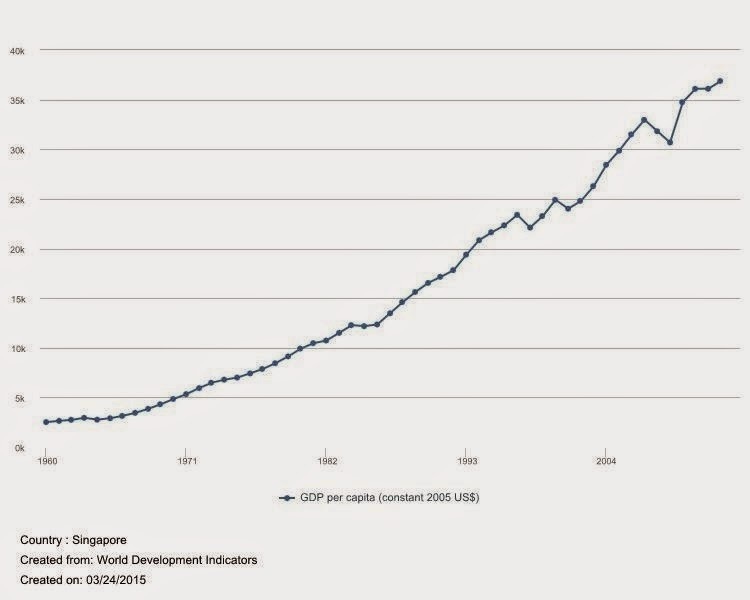 Here's a figure using World Bank data showing per capita GDP in Singapore, adjusted for inflation. During the 53 years from 1960 to 2013, Singapore's economy averaged more than 5% annual growth on a per person basis. For perspective, Singapore's per capita GDP was about 16% of the US level in 1960, and now is almost 80% of the US level. "GDP tripled from less than US$100 billion in 2000 to almost US$300 billion in 2013. Strong growth and low unemployment and inflation have been achieved along with some strong social indicators (e.g. high life expectancy and home ownership). At the same time, however, compared to high-income peers, the labor share of income is low and inequality and the cost of living are high, adversely affecting some population groups. Key supporting factors for Singapore’s strong growth performance have been a stable macroeconomic environment, continuous reforms to upgrade transportation infrastructure and the broader business climate, and a liberal regime for the inflow of foreign workers. The economy remains well-diversified. Known as a financial center and trading hub, Singapore retains a competitive manufacturing sector which contributes more than one sixth of GDP. ... ... The authorities’ plan to raise social and infrastructure spending by 1−2 percent of GDP over the medium term should help reduce the large current account surplus. Financial regulation and supervision is among the best globally and Singapore is a frontrunner in implementing global regulatory reforms." Here are a few other points that caught my eye. Singapore's population has risen by about one-third since 2000, most of that from foreign immigration (the birthrate in Singapore is quite low). In the last few years, the government has sought to slow the inflow of immigrants, and instead to provide subsidies for firms to make investments that can raise the productivity of land and labor--thus also seeking to assure that the economy remains more than just a financial center, but is diversified into other sectors. In 2013, unemployment fell to 1.9%. Many of immigrants since 2000 worked in lower-wage jobs, and so inequality in Singapore has risen since 2000. The rise was particularly marked in the 2000-2006 period. 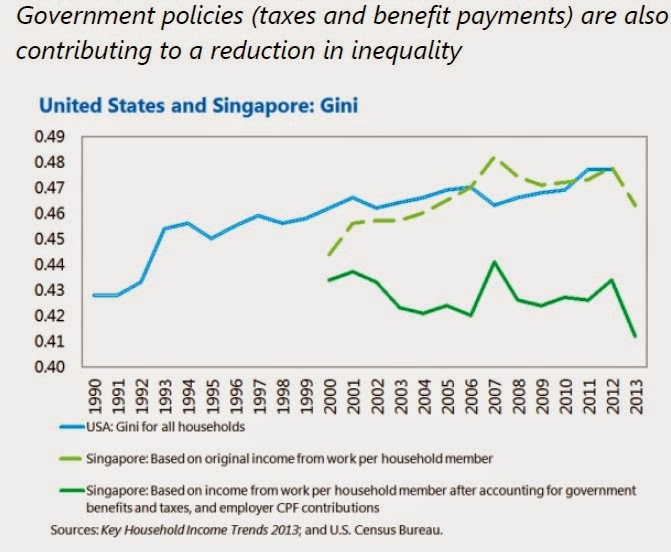 Overall, the level of income inequality in Singapore as measured by the Gini coefficient is roughly at US levels, although redistributive tax and spending policies do reduce that level somewhat. Against Singapore's economic gains under Lee Kuan Yew, there has also been a legacy of repression of free speech and repression of political opposition. There have been laws about everything from spitting on the sidewalk to improper disposal of used chewing gum. For more severe crimes, there has been a threat of harsh legal penalties including caning and capital punishment. Back in the 1990s, one wag christened Singapore as "Disneyland with the death penalty." On the other side, by the standards of murderous and genocidal dictators around the world--which of course is setting the bar dismally low--the level of political repression in Singapore was not very extreme. Lee Kuan Yew did start backing away from formal control of government back in the early 1990s, a quarter-century before his death. Opposition parties won a substantial share of the vote int he 2011 elections. While he was certainly well-to-do economically, he did not pile up personal riches beyond the dreams of avarice. He presided over a government that hired top managers from the public and private sector and strongly discouraged official corruption. Lee Kuan Yew, taking his economic and political record as a whole, is probably about as close an example of a benevolent dictator as the real world in modern times can offer. I feel incapable of rendering any final judgement on his career. Singapore's economic and political path may not have been the best, but it was also far from the worst. Of course, such judgments are not up to me anyway, but instead are most appropriately made by the the people of Singapore as their country evolves after the passage of their nation's founding father. "The OECD has observed, for example, that over the period from 1990 to 2009 the share of labour compensation in national income declined in 26 out of 30 developed economies for which data were available, and calculated that the median labour share of national income across these countries fell considerably from 66.1 per cent to 61.7 per cent." net capital share," presented today at the Brookings Papers on Economic Activity spring conference. Here are some of my own thoughts about the issues. 1) The capital labor movement isn't about inequality of incomes. All wages and compensation are counted as "labor income." Perhaps there are some underlying common reasons why the rising share of capital income and greater inequality of labor income are happening at the same time, but they are not the same thing. 2) Should self-employment income be considered as labor or capital? If you own a business, then part of your income from that business is a return to your labor, while another part is a return to the risk-taking of business ownership, and should conceptually be considered a return to capital. At certain times, this distinction can make a big difference. Rognlie refers to a debate among economists back in the 1950s, after several decades of a falling number of farmers. Most of the farmers were self-employed, and thus their income was categorized as capital income. 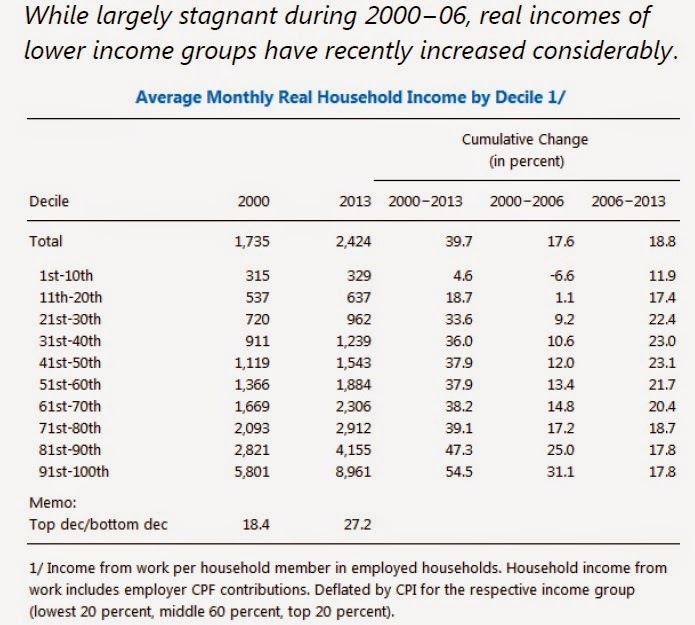 As more workers moved from farm to non-farm employment, their income then became treated as labor income. There are a variety of ways to split up self-employment income into labor and capital components, none of them fully satisfactory. However, there hasn't been a big upward trend in self-employment income in recent decades, so such measurement choices are not going to be much help in explaining the rise in share of income going to capital. 3) Should the focus be on net capital or gross capital? The difference between "gross" and "net" is that "net" takes depreciation of past capital into account. Rognlie explains why the difference matters using an example from an industry where output is produced by short-lived software. As a result, the producer spends a lot on capital every year, but almost all of it is replacing the obsolete software that depreciated the previous year. Here are two figures, with the first one showing the capital share based on gross capital, and the second showing the capital share based on net capital. Capital share is clearly rising in recent years with gross capital, as shown in the bottom figure. With net capital, the rise is more modest. It looks more as if there was a drop-off in capital shares in the 1970s which has since been reversed. Again, the underlying difference here refers to changes over time in how quickly capital investment is wearing out, and to changes in what share of current capital investment is replacing old depreciated capital vs. adding to the overall capital stock. It's worth noting that the conclusion that the rising capital share mostly goes away if you look at net capital rather than gross capital is not at this stage a consensus finding. 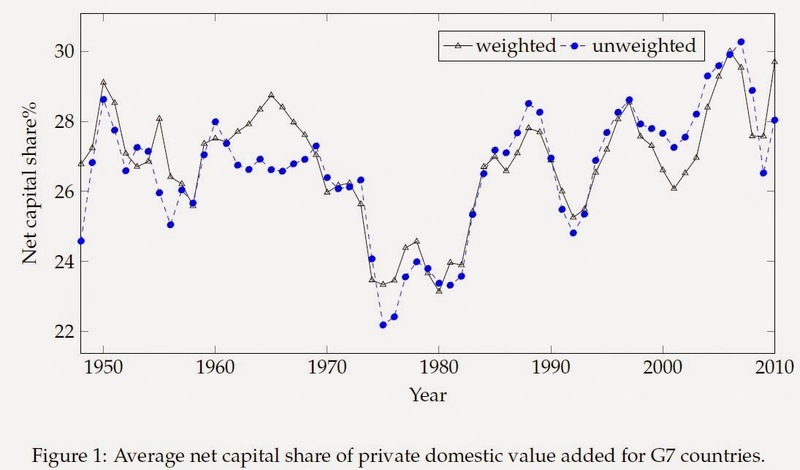 For an argument that using net capital makes the capital share fall, but by a more modest amount, you can check Loukas Karabarbounis and Brent Neiman, “Capital Depreciation and Labor Shares Around the World: Measurement and Implications,” Technical Report, National Bureau of Economic Research 2014. 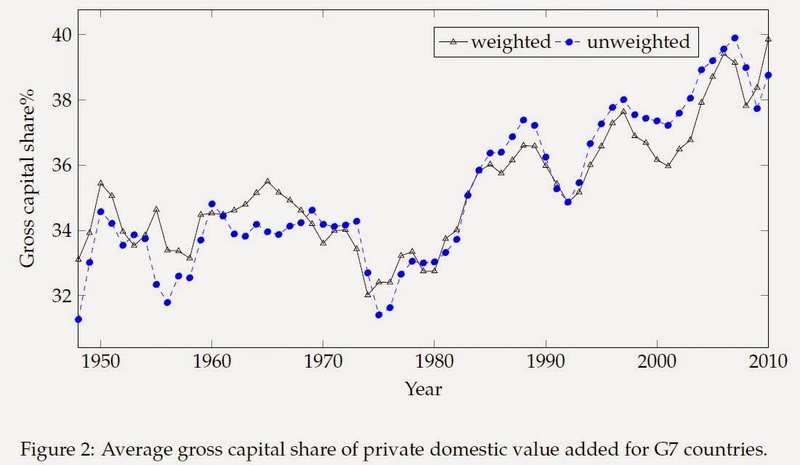 4) Is the rise in capital share mainly housing? Perhaps the most striking finding from Rognlie's analysis is that all of the rise in the capital share can be accounted for by a rise in housing values. Here's a figure illustrating the point. the top yellow line shows the share of capital income using a "net" measure. The red line shows the measure of capital income with housing, the blue line, subtracted out. Income from housing is unlike most other forms of capital income recorded in the national accounts: in countries where homeownership is dominant, most output in the housing sector is recorded as imputed rent paid by homeowners to themselves. ... Indeed, imputed rents from owner-occupied housing should arguably be treated as a form of mixed income akin to self-employment income: in part, they reflect labor by the homeowners themselves. ... [H]ousing has a pivotal role in the modern story of income distribution. Since housing has relatively broad ownership, it does not conform to the traditional story of labor versus capital, nor can its growth be easily explained with many of the stories commonly proposed for the income split elsewhere in the economy—the bargaining power of labor, the growing role of technology, and so on. 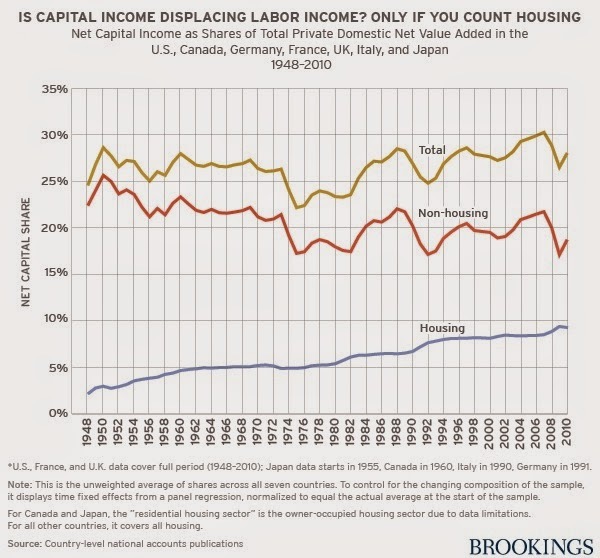 The importance of housing in looking at movements of capital and labor income is not a new insight. For example, Odran Bonnet, Pierre-Henri Bono, Guillaume Camille Chapelle, Étienne Wasmer discuss the point in this readable June 30, 2014, note about their own research:"Capital is not back: A comment on Thomas Piketty’s ‘Capital in the 21st Century.’"
When thinking about the long-term evolution of capital and labor income, it becomes important to remember that capital income can mean different things at different times, and land and housing are part of capital, too. It's easier to provide an economic justification for capital income being paid to those who invest in a productive, job-creating, profit-making firm than it is to justify capital income being paid to a lord from the 19th century who inherited large amounts of land and receives capital income from the rent paid by tenant-farmers. The capital income received by the owner of a factory with a huge and costly physical plant is also not identical in economic meaning to the capital income received by the owner of a firm where the capital depreciates to near-zero almost every year and the value of the firm is based in intellectual property. The rise in capital income as a result of a long-term rise in land and housing prices across the high-income countries is a phenomenon that isn't easily crammed into the usual disputes over whether capital owners are exploiting wage-earners. Jutta Bolt, Marcel Timmer, and Jan Luiten van Zanden appearing in the OECD report from last fall, How Was Life? Global Well-Being Since 1820, which can be read online here. As the figure shows, countries like Japan and Korea had substantial drops in their ratio of consumption to GDP, reflecting rises in saving and investment, but then consumption as a share of rose again. Technological leaders like the US and German economies show much more stability in their consumption/GDP ratio looking back a couple of centuries. Poorer countries back in 1950 like China and Ethiopia have high consumption/GDP ratios, although it's intriguing that Ethiopia is showing a drop in consumption/GDP--and thus a rise in investment--over the last decade or so. In this pattern, consider the peculiarity of China's consumption patterns. It's of course not unexpected that China would have a high consumption/GDP ratio back around 1950. 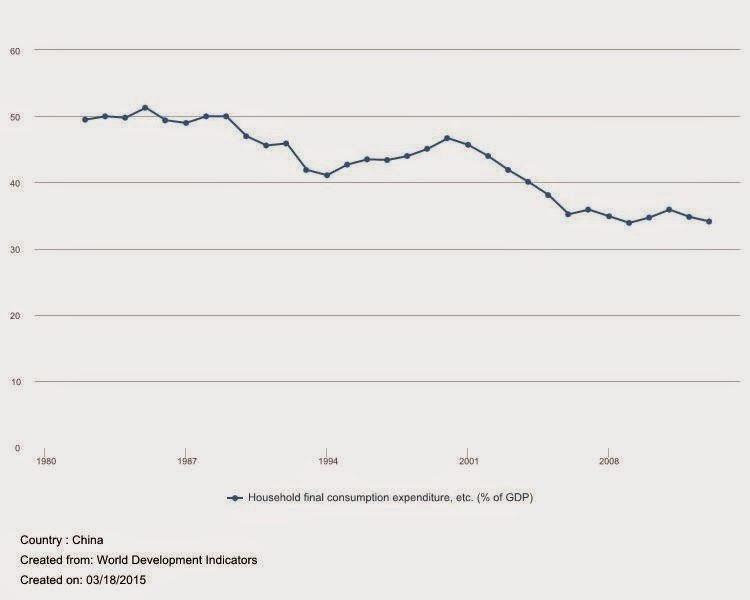 It's not surprising that the various requirements for forced saving under the Mao regime pushed the consumption/GDP ratio down, often at extremely high human cost. It's not surprising that as China's economy liberalized in the 1980s, consumption/GDP fell and investment rose. But what is quite shocking is that as China's economy has grown rapidly, the consumption level has not kept up, and so the consumption/GDP ratio just keeps falling. China's rates of saving and investment are extraordinarily high. The figure above looks at a broad measure of consumption that includes both household consumption and consumption done directly by government. In China, most of the decline in consumption is traceable to a fall in the household portion of consumption. Here are a couple of graphs with data going back to 1980, generated using data from the World Development Indicators from the World Bank. The first one shows the fall in household consumption as a share of GDP over time. 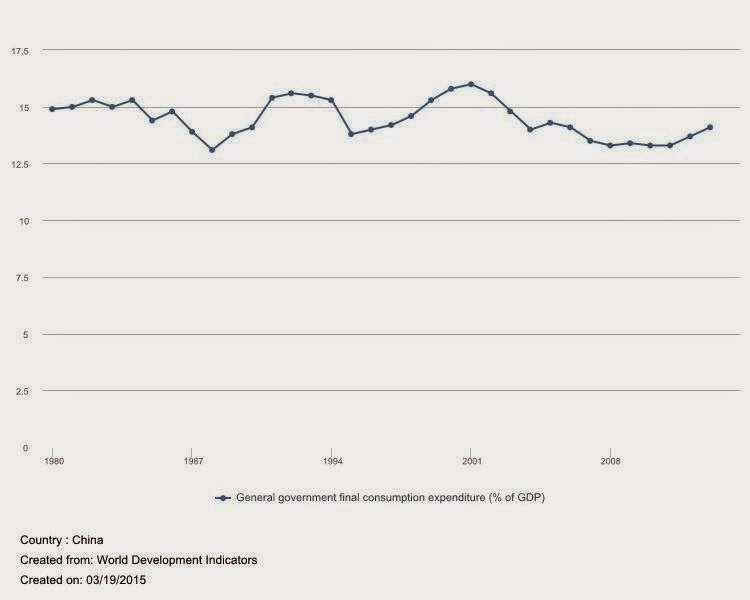 The second shows government final consumption expenditure as a share of GDP, and it has not moved much over time, even as China's economy has grown explosively. 1) For perhaps a decade or so, there has been a strong argument the next stage for China's economic growth would involve "rebalancing" away from an economy that is so extraordinarily heavily on saving and investment and toward an economy more driven by consumption (see also here and here). 2) One channel through which a consumption rise could happen is through government spending on health, education, and assistance for the poor. However, while government spending on consumption has been rising in absolute levels, it has not increased as a share of GDP. 3) The other obvious channel through which consumption could rise is through higher wages and consumption levels by China's households. Again, while household consumption has been rising in absolute levels, it has not been keeping up with growth of GDP, and thus has been falling as a share of GDP. 4) China's economic resurgence is so unprecedented that making predictions is especially uncertain. The optimistic prediction would be that China's economy smoothly rebalances away from investment and toward consumption. The pessimistic prediction is that the extraordinarily fall in consumption/GDP ratios in China is sending us an important message. In well-functioning economies, there is a connection where as firms grow and receive higher revenues and profits, those funds are then cycled back to the broader population in the form of higher wages, as well as higher returns that flow into savings accounts and retirement funds for future consumption. Of course, this process by which firms cycle revenues back to households is always a source of controversy. Various laws and institutions will shape the forms in which money flows back from the firm sector to the household sector, and the level of inequality of incomes that result. But in China's economy, this process of funds flowing from firms back to households seems not to be working very well. The very low rates of consumption/GDP in China, and the corresponding high levels of saving and investment, are driving the amount of credit in China's economy sky-high (as illustrated here and here). China continues to have possibilities for rapid economic growth in the decades to come. But in the short-term or the middle-term, it also increasingly appears that because of the lack of rebalancing to consumption, China's economy is experiencing a credit and investment bubble in a number of sectors that will not end well.